Klinix is a medical billing solution that can be utilized by healthcare organizations of all sizes, be they solo practices or large hospitals. The system is compatible with the Medical Claims Electronic Data Transfer (MC EDT) service. MC EDT is a secure platform for transferring electronic medical data with another user of a similar system. This medical billing system can only be deployed on-premise and has been designed to be suitable for several key medical specialties such as cardiology, radiology, chiropractic, orthopedics, ophthalmology, oncology, pain management, and neurology. Klinix has also been particularly developed for the Medical Services Plan of British Columbia (BC MSP) and Ontario Health Insurance Plan (OHIP). The system allows practices to bill their patients intuitively using a user-friendly interface, process claims into an MC EDT compatible batch file, reconcile claims automatically after loading Remittance advice file, and get support on different payment plans such as RMB, HCP, WCB, or even private billing. The system further offers various billing reports such as EDT reports, billing summary, daily billing, etc. It can create claims using default codes set on the clinic staff information and also support billing multi-day claims which allow practices to bill the same code on multiple days. 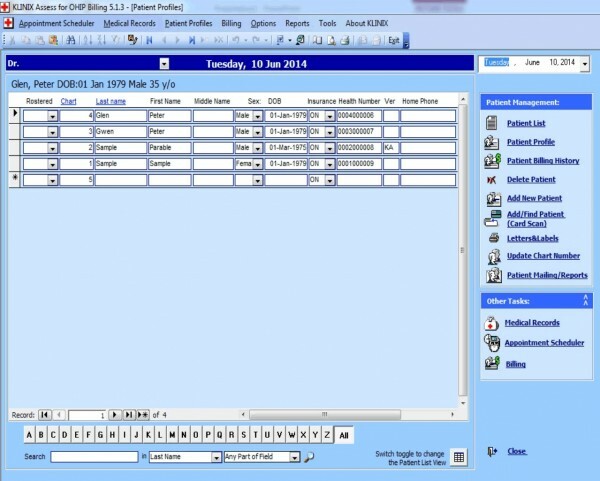 The appointment scheduling module of this system features one-click scheduler billing, allows practice staff to mark physicians’ calendars to save patients appointments, offers multiple or single practitioner view calendar only, can add a one time or recurring appointment and even allow practitioners to view appointments either per day or per week. 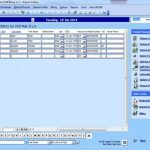 The system also allows practitioners to create their own scheduler template with custom working days, working hours, appointment time intervals, breaks and holidays. 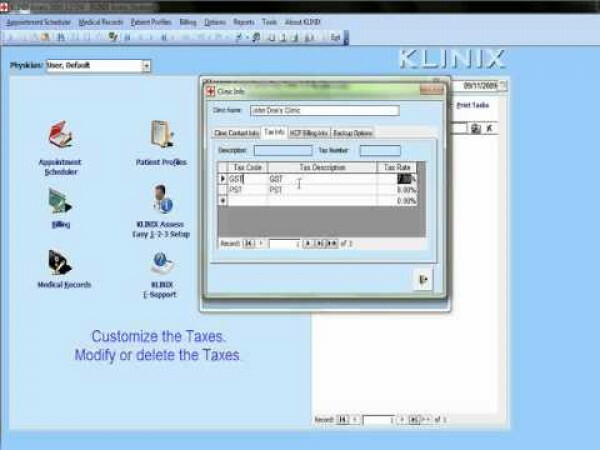 Klinix also features an easily readable comprehensive all in one OHIP billing screen and allows practitioners to bill multiple claims in one screen. The comprehensive claims log screen features multiple detailed views of all the insurance claims. It supports billing and claims submission for both single and multiple practitioner clinics, accommodates all specialties and disciplines, adds custom service codes for private billing and even offers appointment scheduler integrated billing. The system is HIPPA compliant. If you are a healthcare organization looking for the perfect medical billing system, then this might just be the system you need!